“Abraham reached out his hand and took the knife to slaughter his son” (Gen. 22:10). From a human perspective, the Lord’s command for Abraham to offer up Isaac, the one upon whom the promise depends, is absurd. Even with faith Abraham might ask, “How can the Lord ask me to return the very gift He finally gave me?” or, “Will the death of my son destroy the promise and leave me to die a fool?” But these are not Abraham’s final questions. He is convinced the Lord will keep His word through Isaac even though he does not know how God will do it. The patriarch knows his Creator can do the impossible (Heb. 11:17–19) and no doubt hopes he will not have to plunge the knife into Isaac. But in the end, as we see in today’s passage, Abraham is willing to surrender his beloved son. Dr. R.C. Sproul has often described the turmoil Abraham must have felt in obeying God’s demand. As he has said, we dare not sugarcoat the patriarch’s response to the Almighty in Genesis 22. 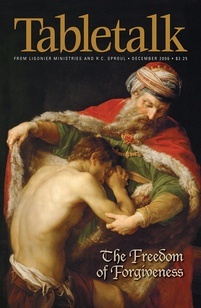 Yes, he trusts the Lord, but how many sleepless nights did the patriarch endure on the way to “the place of which God had told him,” and how great was the sadness he faced as he “bound Isaac his son” (v. 9)? Such insight is not mere conjecture, Moses tells us this is not easy for the patriarch. God’s twofold repetition of “son” and “whom you love” in verse 2, for example, illustrates the high cost of the Lord’s call; it is one not easily heeded. Yet Abraham moves forward, clinging to the Lord’s promise even though doing so troubled him greatly. Living by faith often means we grit our teeth and press on in obedience to the Lord’s command despite our turmoil over it. Our spouses may hurt us deeply, and we may feel like responding in kind, but we strive to do otherwise, for the sake of marriage vows made in the name of our triune Lord. Since God demands it (1 Peter 2:18), we go the extra mile for that boss who never thanks us even when our natural inclination is to do the job only half-way. Because we know the Lord wants us to keep our commitments (Eccl. 5:1–7), we join an orthodox church and serve the body even if our favorite pastor leaves or we do not like all of the music. True faith, Abraham shows us, serves God even if it is the last thing we feel like doing. We do not need a major tragedy to make us feel as if we are clinging to God’s promises by our fingernails. Sometimes our daily problems can build to the point where we hardly feel like keeping the promises we have made to the Lord and others. However, faith means doing what is right even if we do not feel like it because we trust God’s promise to bless His servants. Today, do the right thing, keep that commitment you have been putting off.